So, say we wanted to head somewhere for about a week, and wanted some long, wild, but fairly mild riding (literally gravel roads and double tracks), where would people suggest? The Cairngorms are an obvious option, and even have some easy looking tracks heading to the tops of Munros like Glas Tulaichean. The Old Military Road to Fort William perhaps. But beyond that, I just find way too many options to make a decision. What about the Badger Divide route? Designed to be ridden on gravel bikes instead of proper MTBs? I don’t live up that way, so no doubt others can provide loads, but it is a route i fancy having a crack at so have been reading up on the other day. 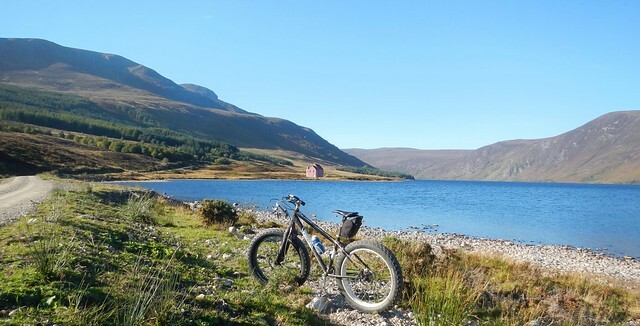 Skye , Torridon & Glencoe …arent the best spots for mountain biking ? Are you having a laugh ..they are among the best spots ..but not for the type of riding you are suggesting ..there are some easyish doubletrack trails out of Aviemore ..ring Bothy Bikes who will suggest some routes and they also do their own maps ..
My assumption was rather basic… that the bigger the mountains get the harder it may be to find easy (and still wild) riding. But I know that’s not true for the Cairngorms as they’re much less steep and rocky than the North West Highlands tend to be. I suppose i’m thinking in relative terms as well. For climbing mountains Glencoe, Skye and Torridon are well worth the journey as England and Wales have nothing that compares. But for riding I would imagine the returns for that long a journey aren’t so great, as there are much closer places worth visiting. Might be worth looking at the area north of the Contin/Strathpeffer to Ullapool road. There’s a lot of long estate tracks in there. There’s also one of the various versions of the Scottish Coast to Coast. Further south there’s the Wild about Argyll Way which is being marketed as being gravel bike friendly. 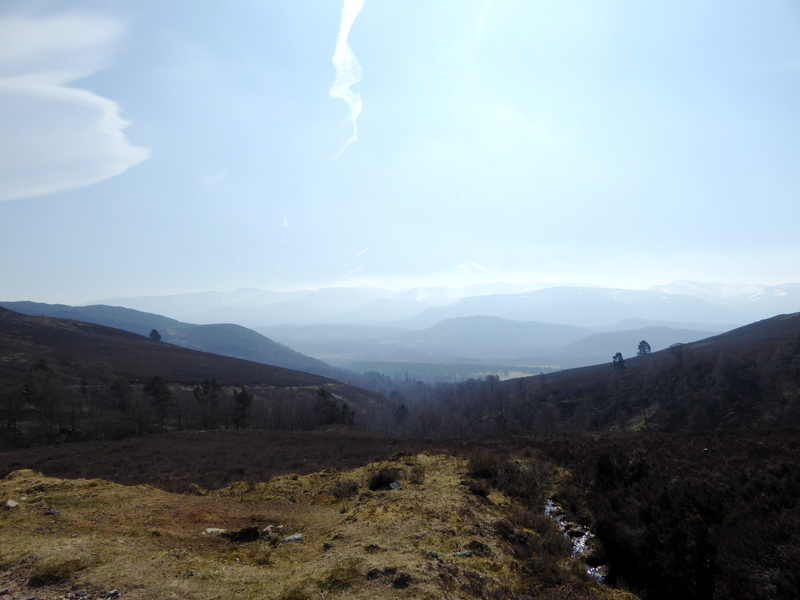 The track from Coylumbridge ( Aviemore) up Glen Eanaich as far as Loch Eanaich would be doable on a gravel bike ..its pretty straightforward as a there and back .. There is a good book called Scottish hill tracks by by Ralph Storer. If it’s gravel your after, either Cairngorms or Galloway. 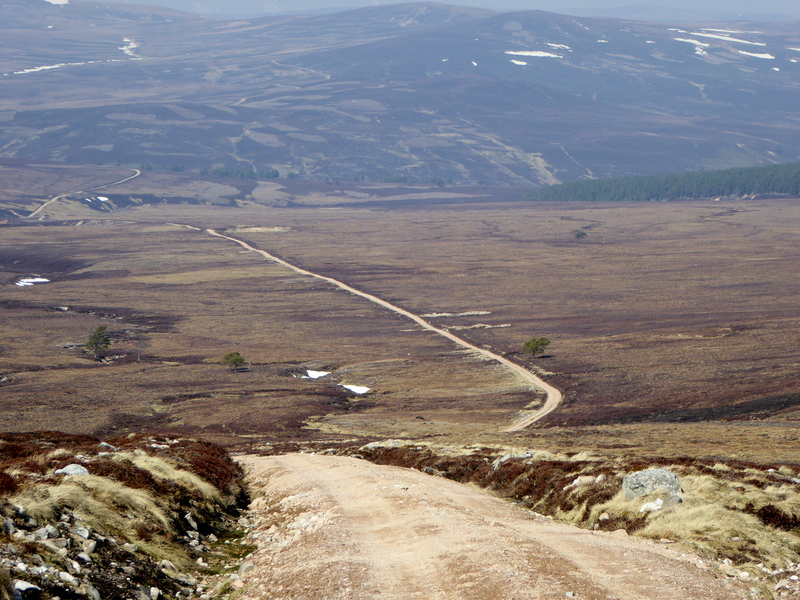 If it’s the Aviemore area you end up in, tap me up for a selection of suitable routes. 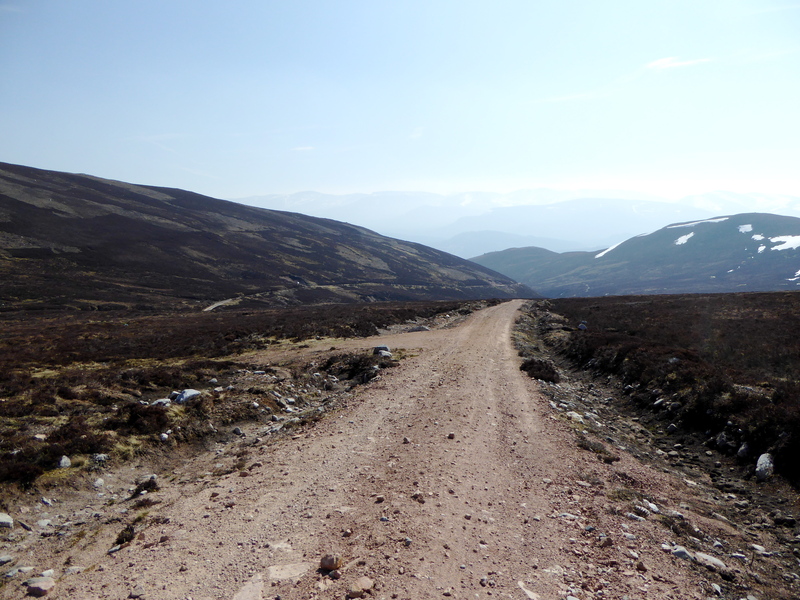 Great Glen Way, Speyside Way and Dava Way all make for decent “gravel” riding too. There is a good route to be made in Caithness too I reckon. The Corrieyairack should be doable on a gravel bike. I used to do it regularly as a loop from Inverness on a dropbar bike over 50 years ago. There’s other trails that fit in but I haven’t ridden them for a long time. 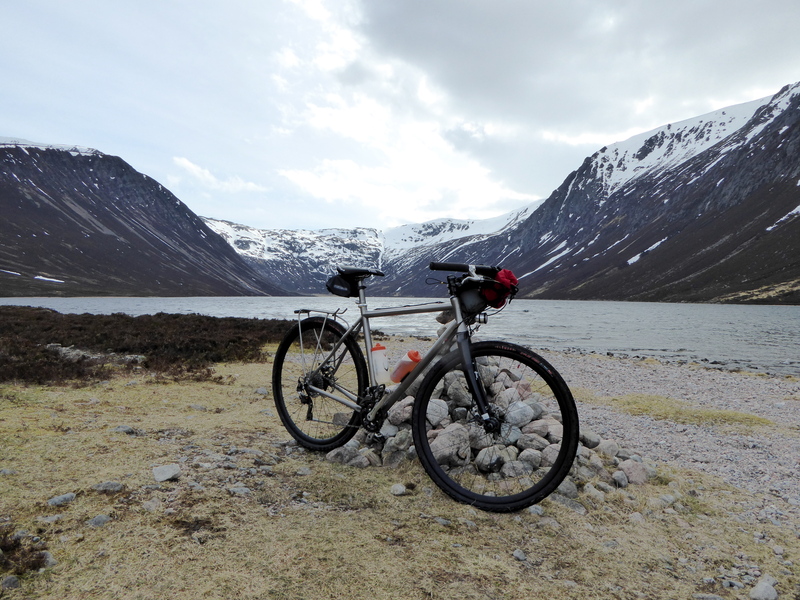 The Great Glen Way (also ok for a gravel bike) from Inverness followed by the Corrieyairack appeals to me. I did it the Corrieyairack on Big Apples (virtually no tread) 2 years ago – there’s bits where you’d have to be careful but nowhere you’d need to get off for any distance. 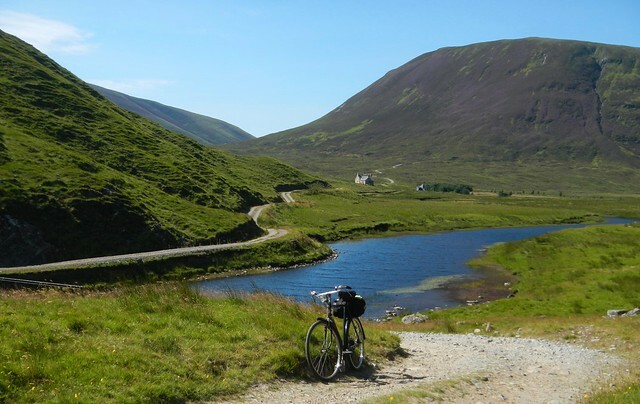 You can put together some big loops up north of Dingwall on a gravel bike. eg Ardross to Alladale, thence to Ullapool Rood just south of Loch Glascarnoch, short road transit the look for the track going left which will take you along the north side of Ben Wyvis (it’s relatively new) and you come out at Eilanach Lodge, road thereafter to Evanton and back up to Ardross. Easily doable in a day on a singlespeed by a fossil. Alternative: from the Ullapool Road a slightly longer road transit to Black Water Bridge, take the forestry tracks there almost to Rogie farm, but bear left and take the long climb which will take you along the south side of Ben Wyvis, and eventually out on the the Heights of Docharty between Dingwall and Strathpeffer, then by road back to start (although it could be done offroad, but you’d have some proper mountainbike and hike-a-bike work then). Some nice routes around Glen Affric area. Can feel pretty wild, with proper mountains and forests. A loop of Loch Affric, and out to the youth hostel and back. 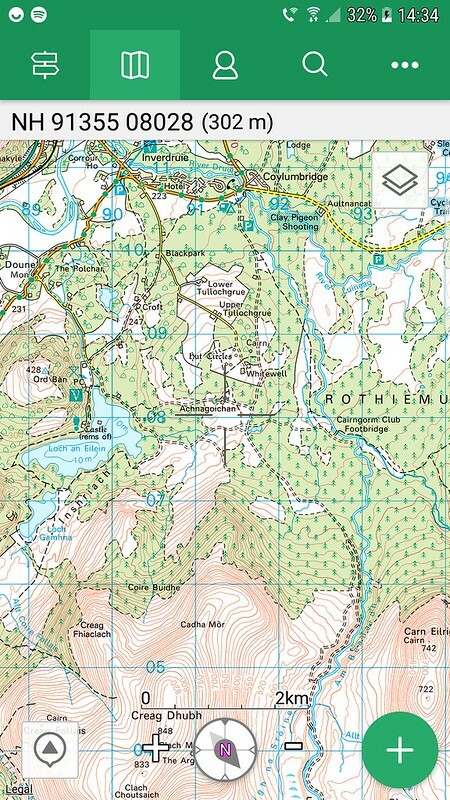 Or interesting tracks around the south side of Loch Beinn a Mheadhoin, Tomich, Plodda. 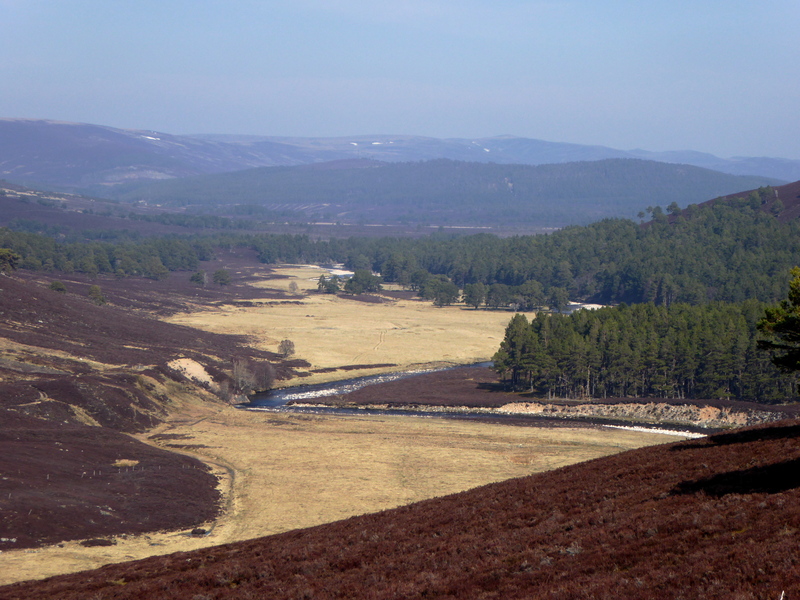 Or the power line track over to Glen Moriston. Also along Glen Strathfarrar, for a really quiet road route. 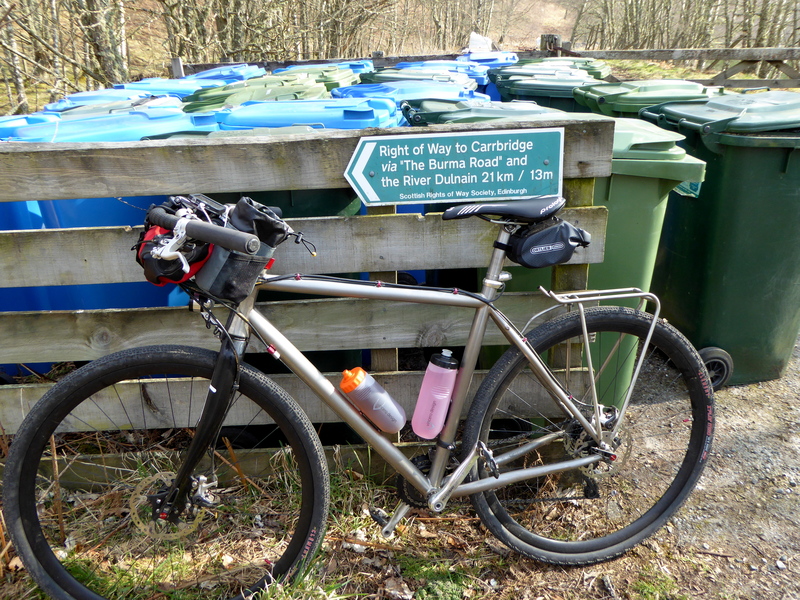 Tyndrum to kingshouse on the west highland way is nearly all non single track (sorry, can’t bring myself to call it gravel). Skip the BoO to inveroran bit by going along the minor road. Having said which I wouldn’t really want to do it on a drop bar bike but each to their own. 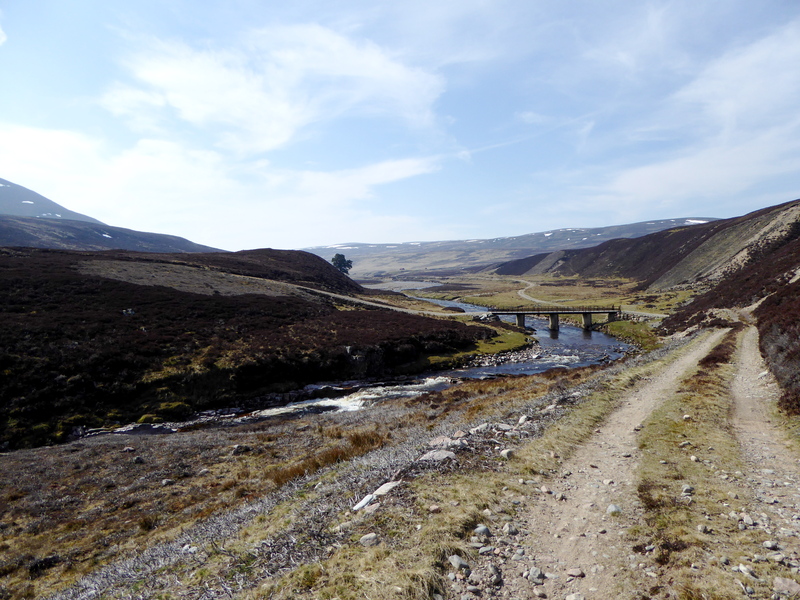 While I remember – Laggan, Ardverickie, Corrour and the “Road to the Isles” to Rannoch. Loch Eanaich route is very doable on 40mm tyres, if the wind is behind you on the way back down it’s very entertaining, there’s only one corner you have to slow down/brake for – DON’T forget to brake. Last year there was a mini landslide on the lower section on the way back down (take the high road on the way out for the views), prob all cleared by now. The Burma Road is worth a run, one of my favs on a nice day. Burma road is one of the dullest days I have ever spent on a bike. It’s not on my to do list either . Oh Jesus, those photos capture exactly what I’m after… Stunning… if only weather like that in Scotland wasn’t so hard to catch. So Loch Eanaich looks great. I’d actually spotted that before and wondered whether you could do that, then walk 5-6km south from the loch up and over to the track that ends near the Tom Dubh summit. 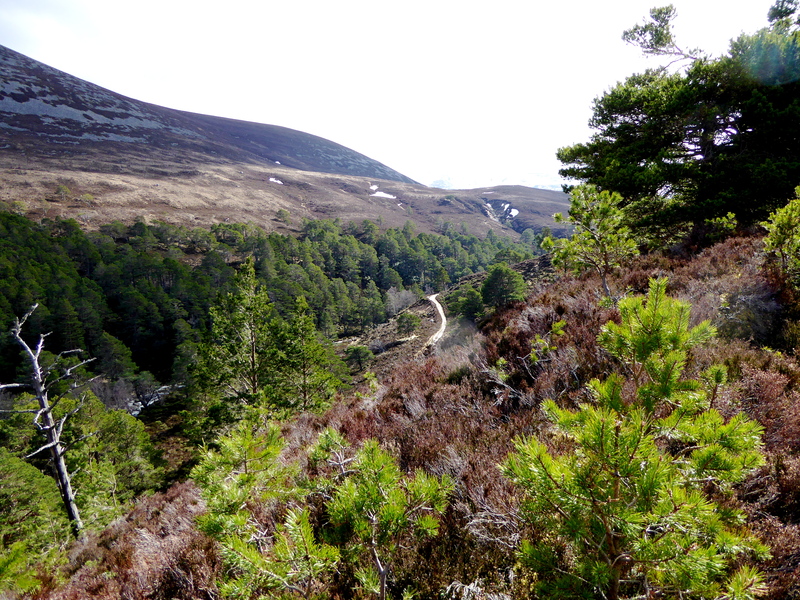 From there, there’d be a steep (but hopefully well surfaced) track down into Glen Feshie, and a long valley cycle back to the road. 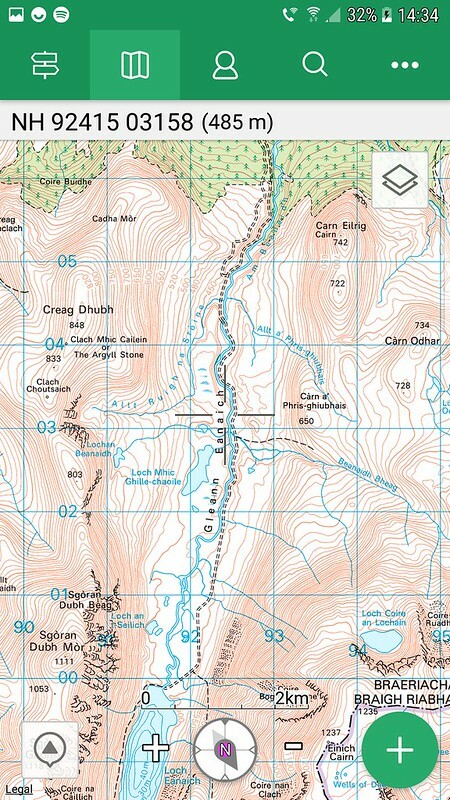 Add the Burma road, the Corrieyairack, and it’s would already look a good plan for a Cairngorms week. Glen Affric looks ace too, and that route north of Dingwall looks a great long day out. Hmm, we did that a while ago (day that Diana woman died, which must make it about 20 years ago) on rigid mtbs. It was an adventure, but TBH the descent into Feshie wasn’t a lot of fun. I imagine it’d be purgatory on a gr… on a gra… on the type of bike you’re talking about. If you do the Corrieyairack, don’t take it lightly. I had to overnight once near the top in a blizzard in August (many years ago). Next day sun was out, all snow melted, and got sunburn. In other words dress for the mountain, not the bike. 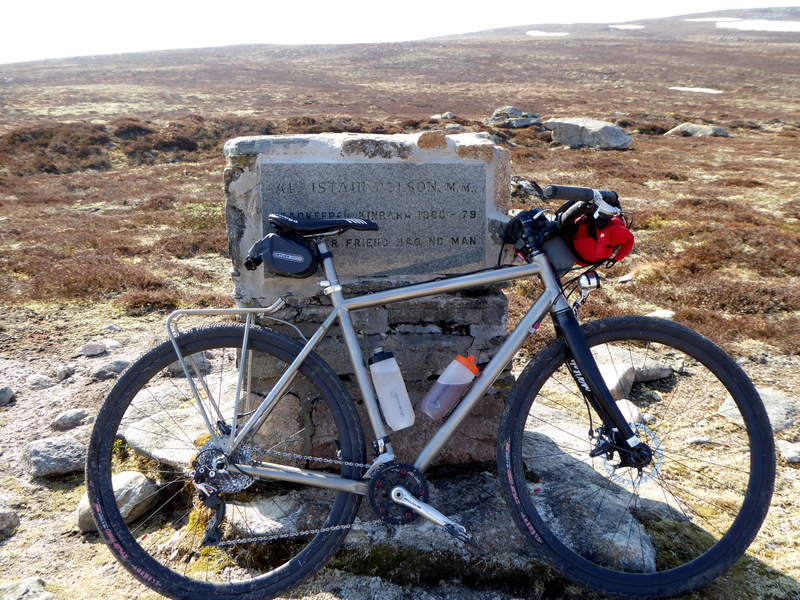 Much of the Cairngorm stuff posted above, whilst obviously doable on a gravel bike, is so much more fun on a MTB. I have ridden most of it and rarely opt for my Croix de Fer. Hardtail is my first choice. wondered whether you could do that, then walk 5-6km south from the loch up and over to the track that ends near the Tom Dubh summit. 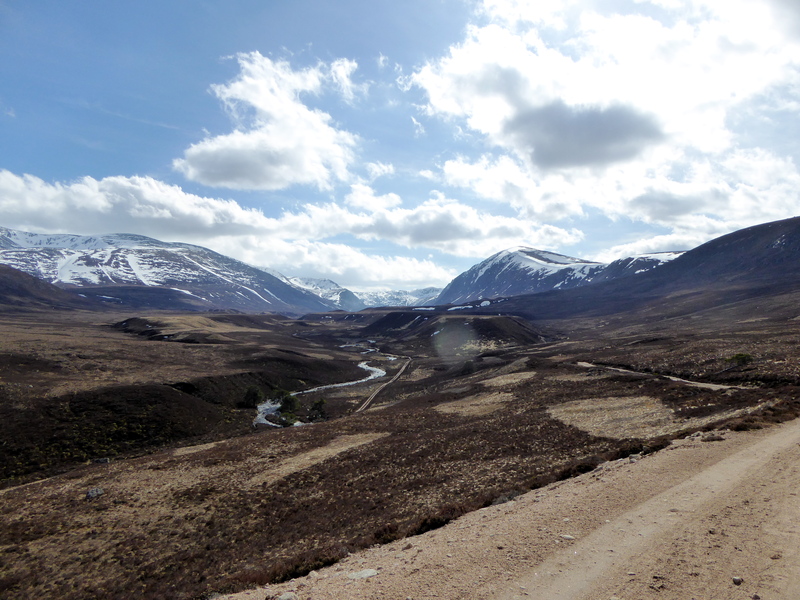 From there, there’d be a steep (but hopefully well surfaced) track down into Glen Feshie, and a long valley cycle back to the road. 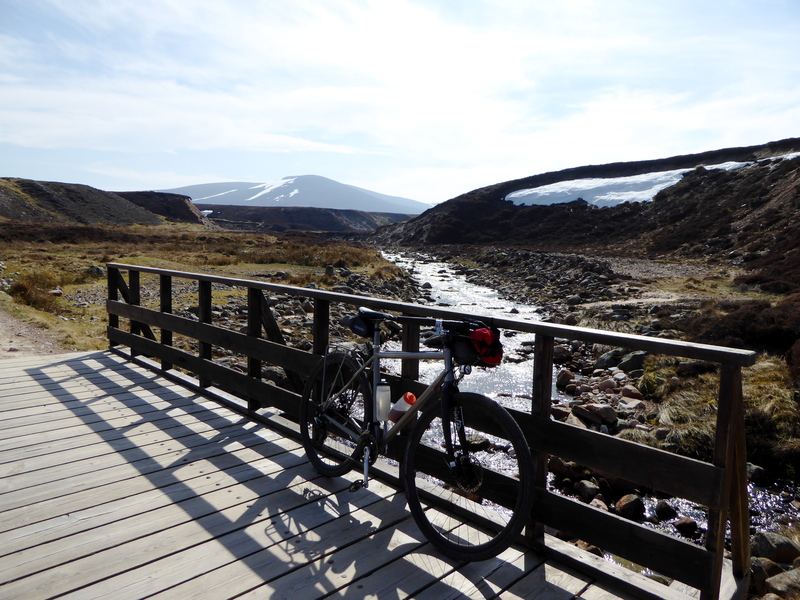 I rode Epicyclo’s routes around Ben Wyvis last year and would highly recommend, probably a little milder and flatter than some of the Cairngorms stuff too. Holy thread resurection……ok, Mrs B has set her heart on the Badger divide route. And maybe a suggestion as to weather we take 29ers or beloved gravel bikes please. Can’t help with anything on the southern bit. From Fort Augustus you could follow the Highland Trail route as far as Struy or if you want to do the track of a thousand puddles on to Contin/Strathpeffer as an alternative. If you don’t want to do the bit of pushing by Loch ma Stack which is on the northbound leg then a little further west is the return route which takes a new wind farm track over to Tomich. @epicyclo posted about riding the track of a thousand puddles recently, might be worth searching for that. Riding in from Laggan and out to Rannoch you will have no problems at all on a Grrr bike but still, I’d be taking a 29er over my own C de F. It’s not that the 40mm tyred rigid bike would be ‘wrong’, it’s simply that personally, I’d expect to enjoy that journey more on a 29er hardtail. If you’re keen to go with the CX bike compromises, you’ll still have a ball on the grrr bike. 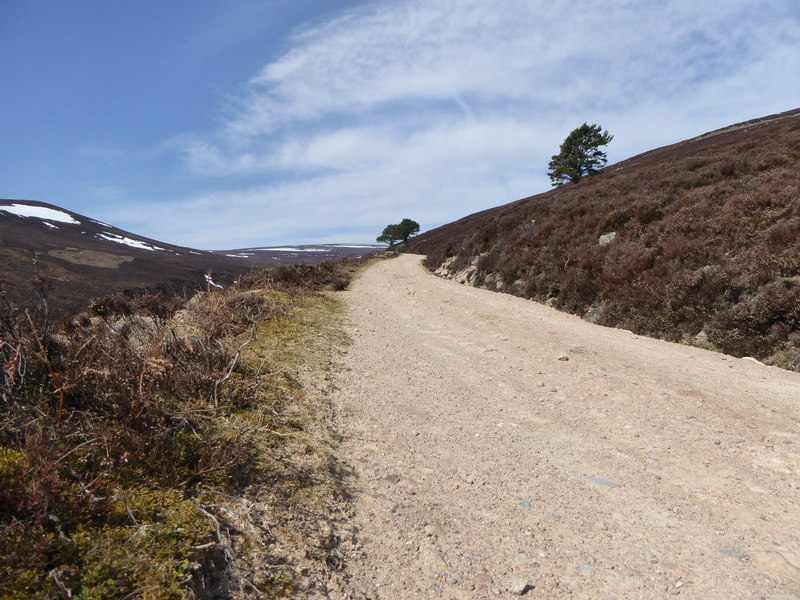 Great Glen sections are mostly very good surfaces that will be fine on smaller tyres, although the two ‘top route’ sections after Drum contain a surprisingly large amount of climbing. 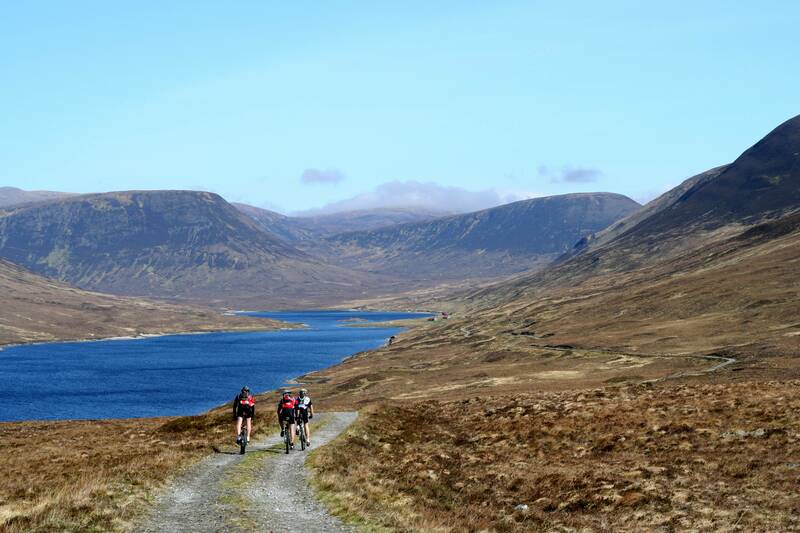 The Corrieyairick climb will be hard and the descent harder, as it is pretty rocky for a rigid bike but again, if you know what to expect, you’ll be fine. 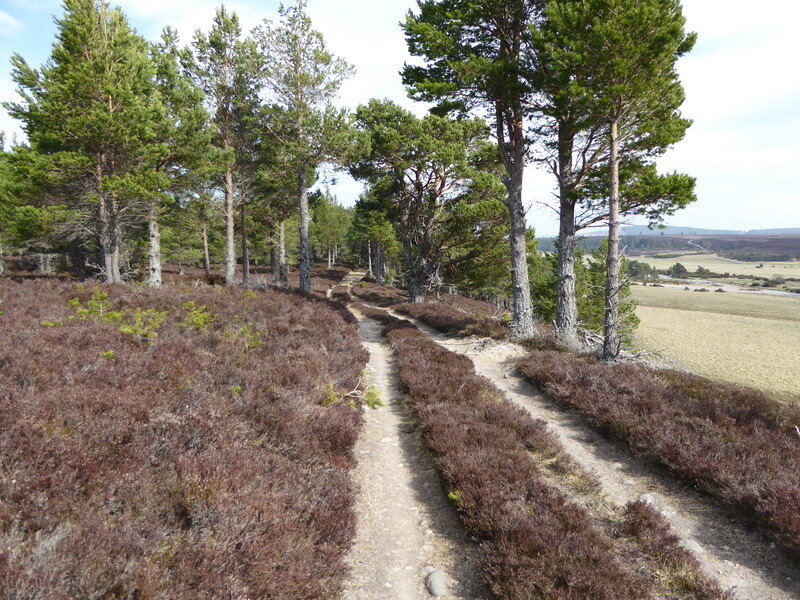 Once past Rannoch, the surfaces are almost entirely good tracks & cycle paths, so all do-able. Enjoy and let us know what you make of it. guys this is ace. thank you. As an occasional “gravel” biker I am sure somafunk, myself and other locals could come up with some decent rides. A group of bike-packers recently rode from Ae to Peebles, I wondered why there were so many tyre tracks on a track I use occasionally and then it popped up on my FB feed!!!! Myself and others do a ride which joins Mabie and Dalbeattie and back which is around 50mls but could be made longer. Joining those to Ae and or Drumlanrig wouldn’t be too difficult. It’s spmething I may workmon next year when I retire, my only issue guiding is being auld,n slow!!!!!! As an idea for a route? I did this a couple of weeks ago. OS78 Nithsdale. From Dumfries I followed Sustrans 10 route out on The Caledonian cycle way out to Ae. The route then takes(signposted)the Lamphit forest track(up the DH access road). The route is well signposted all the way up to a road known locally by various names ie the Sqiglly Rd. Turn left to Kinnelhead, through the farm to the right and carry on to end of farm track until you come to another house/farm. Follow track up to gate. Through gate, follow track. Half a mile or so there is a track to your right, go down this and over dodgy bridge and up to gate. Through gate onto forest track. Follow forestvtrack ignoring all left/right junctions. At a sign for Revox look for SupW signs on post to right, turn right down vague track and follow SupW signs back to “Squiglly Rd and turn right back to start off return route via Ae. You will see a sign post, Ae 12 and Dfs 22. For me this was a 50ml trip. Loads more miles could be added in Ae or travelling out to Mabie via various trails around town. To cut a long story short, I didn’t manage a trip with my (now ex) partner, at least not an offroad one, but plan to do a couple this spring/summer myself. One being the Badger Divide, hopefully extended up to Durness (I’ll post a route when I’ve got a better plan). The other, I want to go over to Mull and the peninsula north of it where Sanna Bay is. I just sketched out a route — if anyone has any knowledge of it that’d be great. I’d hope to take my gravel/monstercross/all terrain bike. The important bit is I’d be on 700x47mm tyres, reluctant to take the mtb as there’ll be a fair bit of road. Kentra to Ockle will be a handful with those tyres, though more manageable if dry. On balance, I reckon you should just compromise on that section as the rest of it should be fine. Thanks scotroutes, I’d thought the same about that section, looks stunning though. For the record, have you added anything to this map? I’m off touring Mull and Ardnamurchan on my gravel bike next week. Jump onto Mull via Loch Aline then back via the ferry from Tobermory. You can do a nice loop and hit Sanna on the way back if you’ve left a vehicle by the Corran Ferry. I lived on the Ardnamurchan for 3 years it’s stunning and quiet. Keep your wits about you on the single track roads the locals drive like loons as it’s great fun to do so. Ah just followed your link. It’s a nice route. I rode from Crianlarich to Fort William on WHW start of this week. Great scenery but glad I was on a hard tail I must say. I was wild camping near the Kingshouse Hotel in Glencoe. Public loos by the car park with hot water was a nice bonus. …I’d hope to take my gravel/monstercross/all terrain bike. The important bit is I’d be on 700x47mm tyres, reluctant to take the mtb as there’ll be a fair bit of road…. Don’t underestimate how good 2.35 Big Apples or G-One are. Although virtually treadless, if they are run at a suitable pressure, they conform to the surface, so there’s plenty grip except on mud. I used them for a Corrieyarack ride without problems. They’re my go to tyre for gravel, because they’re nice and fast on the road transits too. 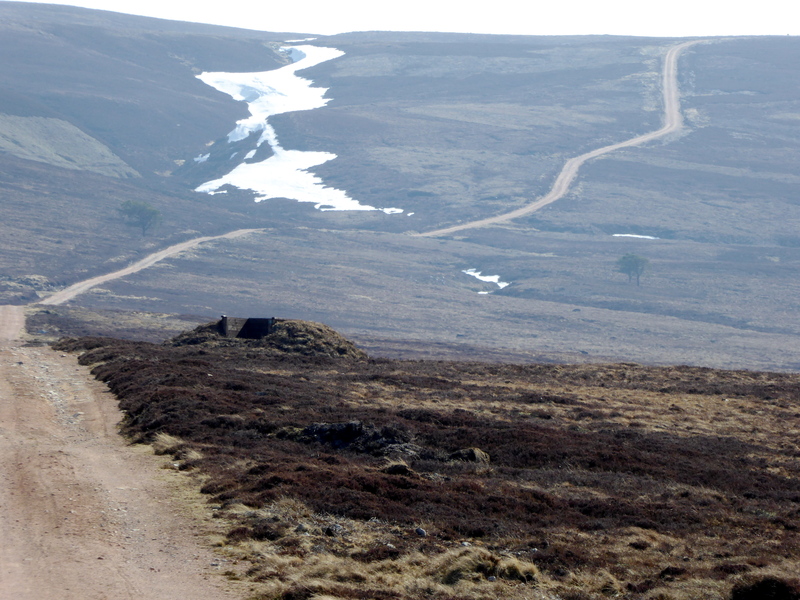 North of Inverness and west of Dingwall there’s plenty really long gravel rides available. You can ride from above Dingwall along the gravel road on the south face of Ben Wyvis, and come out at Black Water Bridge, then a few miles further on along the road to Ullapool, veer right onto more gravel and head along Strath Vaich which will take you to Alladale where you can rejoin the tarmac, or head back south along the gravel until you get to tarmac at Braeantra, go along Strath Rusdale until you come on to the road south back to Dingwall. It’s a great day out, brilliant scenery, and if I can do it on a 70 year old bike with rod brakes and 37mm tyres, you’ll have no trouble with your bike. You can do a big estate road loop from Strathpeffer around Wyvis, up Strath Vaich to Deanich, Glencalvie, Loch Morie, Evanton (around 130km in total). All fairly straightforward track, from memory, but some great views and remote country. Round Beinn Dearg from Ullapool with a night in the charming Schoolhouse bothy if you fancy (it’s easily doable in a day though).